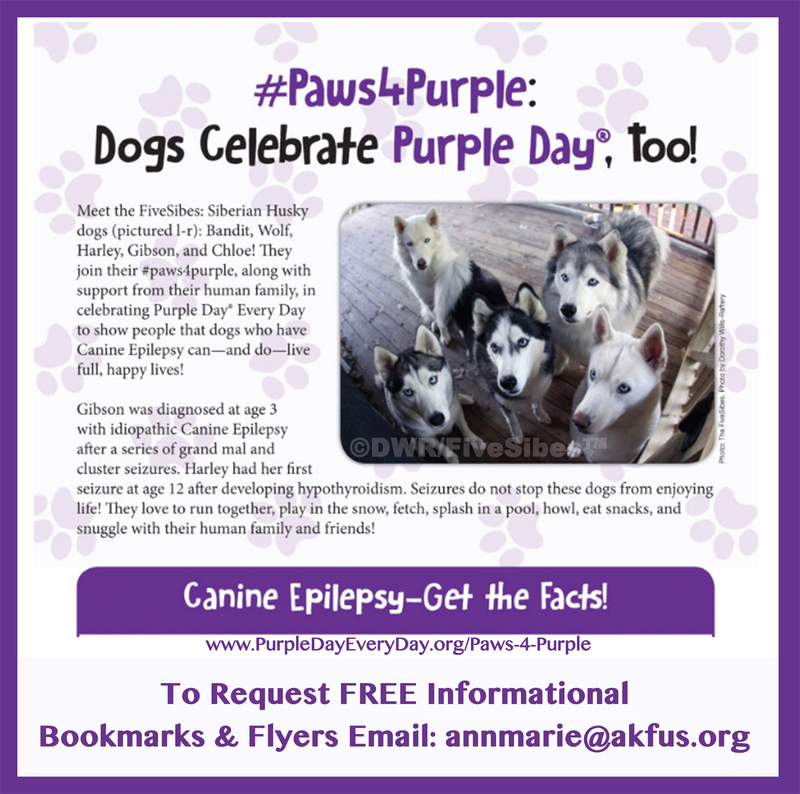 While we are wrapping up the November's Epilepsy Awareness Month, with our focus on Canine Epilepsy, many folks are prepping for the holidays ahead. 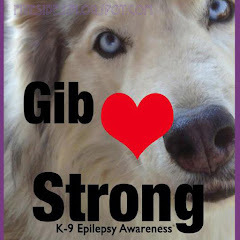 Over the many years of mine and Gibson's journey with Canine Epilepsy, folks have asked what types of things did I do and use when he had a seizure, after, and to help manage his comfort each day. 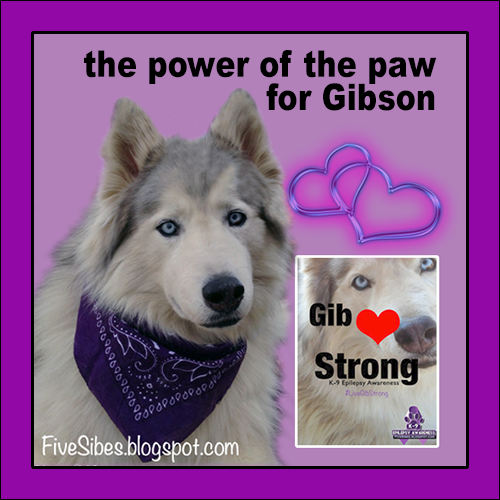 I am pleased to say that I have put together a catalog of mine and Gibson's favorite items in a different type of Gift Guide--one specifically for all the amazing dogs living with Canine Epilepsy! 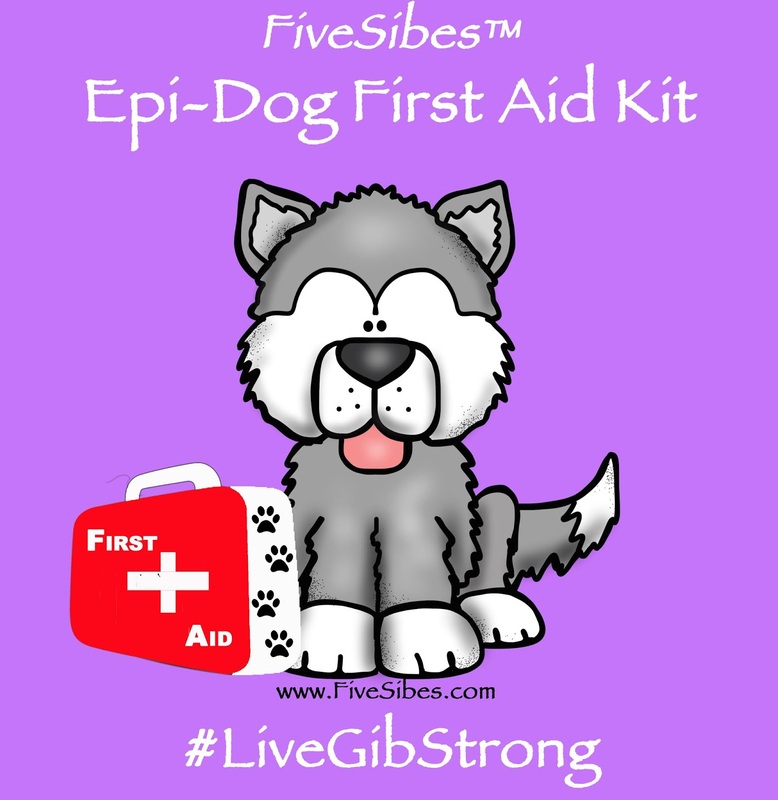 Our FiveSibes #LiveGibStrong Gift Guide for Epi-Dogs is filled with useful items ranging from products I used with Gibson to help keep an Epi-dog comfy, to items that we have in our Epi First Aid Kit, as well as helpful books, and Canine Epilepsy educational resources. There is also a section for FREE items! 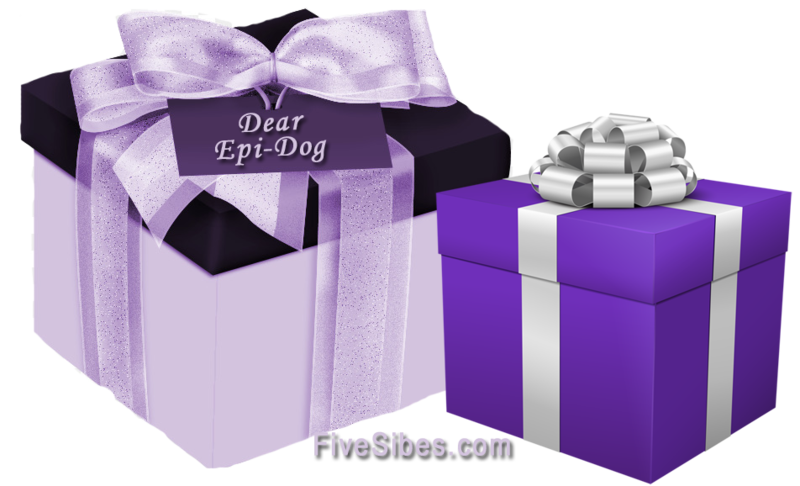 So grab a cup of your favorite seasonal beverage, snuggle up with your furbaby, and check out our entire Gift Guide for Epi-Dogs for some great items that some very special dogs (Epis and non) would love to receive this holiday season, on their birthday, or any day of the year! 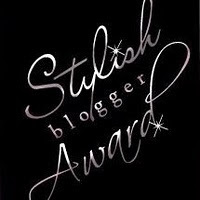 Be sure to check them all out so you don't miss a thing, including the Freebies! 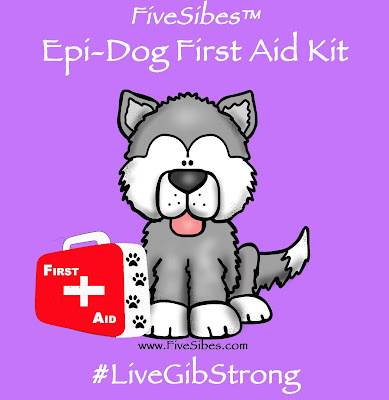 All of the products listed here in our FiveSibes #LiveGibStrong Gift Guide for Epi-Dogs I have used for my beloved Gibson and found them to work really well. 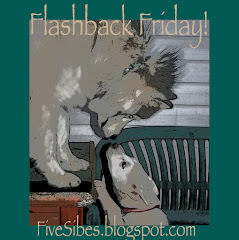 Some I even continue to use with my other FiveSibes as they are now seniors and need a little extra comfort. 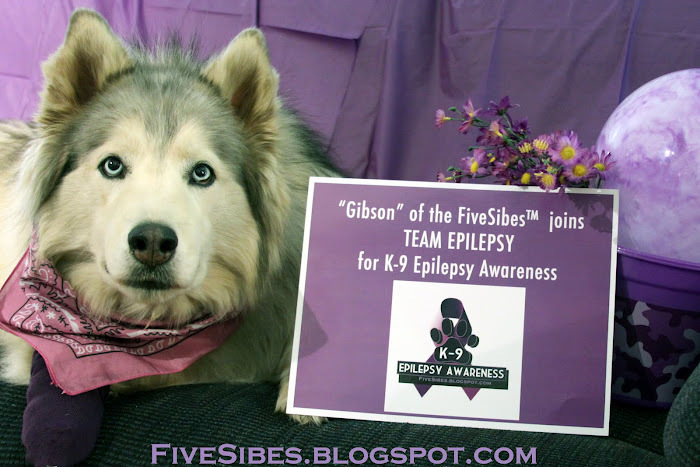 My Harley girl also has had several adult onset seizures, so I follow some of the same protocols I did for Gibson, and want to share them here with you so maybe they will also help bring some relief for your Epi-dog. 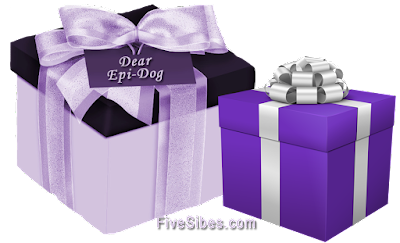 I hope you enjoy this Gift Guide for Epi-Dogs (best read in "desktop" view) and find it to be helpful! 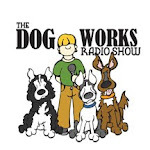 And do let me know if you try any of the products and what your dog thinks of it! Happy reading (and hopefully, some shopping)! 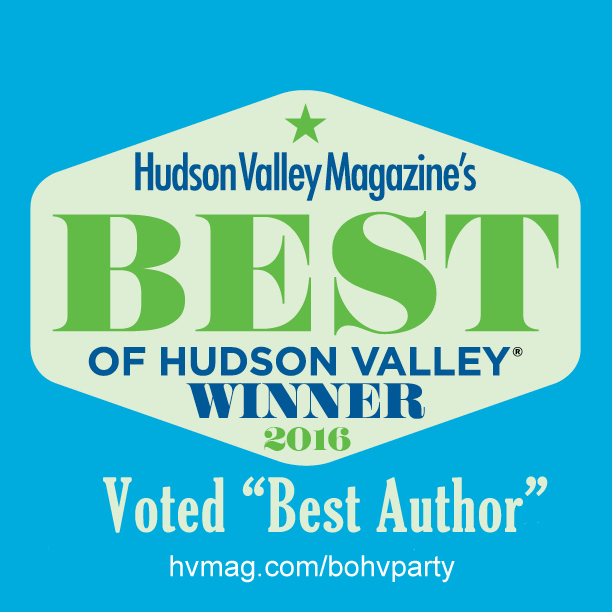 Feel free to share with your friends, too! All items in our Gift Guide are FiveSibes approved! 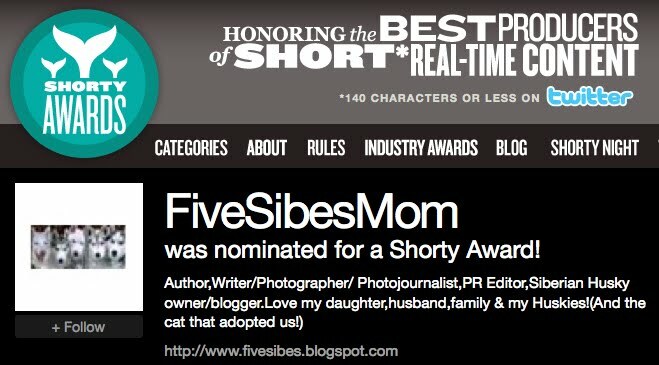 A Note About Affiliate Links: This is not a paid post. It reflects products I use and choose to write about. It does, however, contain some Amazon affiliate links, meaning if you click on the link for the product and purchase the item through the affiliate link, I will receive a small commission with no extra cost to you. 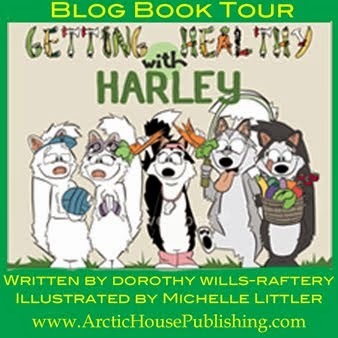 If you decide to purchase one of my books through the affiliate link, you can also be confident that it is an original brand new book, and that the “seller” is me and my ArcticHouse Publishing company (and not a resale through an unknown party). All products have been tested and used by me and my FiveSibes. I only share links to products I use. Thank you! Gibson loved this bed! It comes in various sizes and you can use it indoors or outside. You simply fill it up with cool water. With overheating being one possible seizure trigger, I always tried to keep Gibson cool (especially with him being a large wooly Husky) and this bed did the trick! I do recommend putting a cloth bed or towel under it, for some added comfort, and just in case it springs a leak if a set of canine teeth test it out! A great fast cool down on those hot days or any day your Epi-dog seems stressed over hot. In between uses, store in freezer in a freezer-style resealable bag. Great to keep on hand in the freezer! 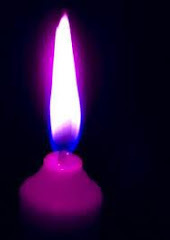 Handmade, choice of colors (we have purple, of course)! For use on days when your Epi-dog seems agitated, stressed, or scared. Has a nice herbal aroma. How handsome did Gib look in his "bow tie" Herbal Calming Collar? This is another favorite item! Take it along on walks, pack it in the backpack, bring it in the car, or give your dog a cool spritz any time, anywhere you think s/he needs it! A really great instant cool down...and, as you can see, Gibson really loved it! 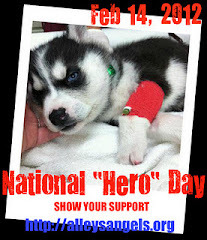 My favorite tool for helping Gibson on the days he experienced hind-end weakness due to his Epi meds. 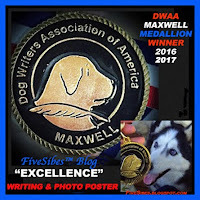 This one connects to the collar and affords ease in supporting and walking your dog. Super sturdy. Love this lift harness! Excellent for getting a dog with mobility issues into a vehicle ~and~ a makeshift stretcher. All of my FiveSibes love this bed! 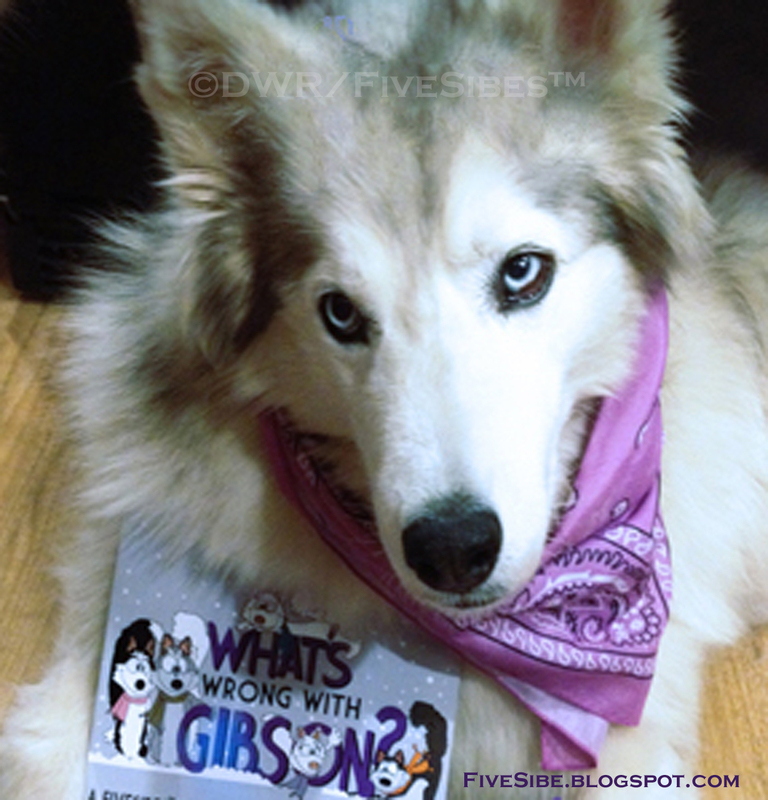 Water-resistent base and removable washable cover a necessity for an Epi-dog who may have a seizure while on it. Easy clean up, provides dog with great comfort. Above Cooler Bed III can be placed right on top of it, too. Comes in sizes Small to Jumbo (Gib Size)! A great cover to protect the cargo section of your SUV. 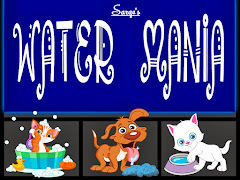 Waterproof and easy to clean, a must with an Epi-dog, or any dog who just loves the mud and dirt! 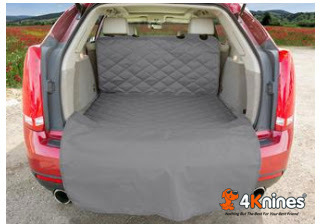 Click HERE for this cargo liner (comes in Black, Gray & Tan, and various sizes) as well as other fab vehicle seat covers! Click HERE for Cargo Liner & Seat Covers! There are times you need immediate cool down and this being a battery-operated makes it very convenient to put it wherever your Epi-dog is. 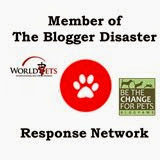 Not only for Epi-dogs, but any dog who may be feeling anxious or stressed. This is the plug-in version of above and is nice to address an entire area. 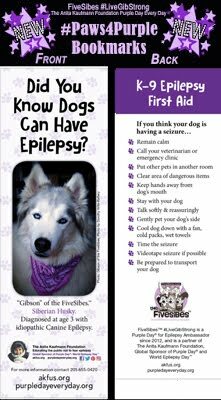 I used it in the FiveSibes room at night during storms and fireworks as a defense against possible seizure triggers for Gibson. A necessity if you have above! I always kept an extra one on hand in my Epi-First Aid Kit! Also good for anti-anxiety or to help de-stress an Epi-dog. Caution: do not leave on indefinitely, just during the stressful period as heat/overheating can also be a possible seizure trigger. A natural way to add a light calmness to the air. Always check with your vet first, and be sure you have pure lavender oil (and NEVER spike lavender). I love my diffuser for the essential oils! There is also a setting to have a light on and choice of color! For emergency cool down during and after a seizure. 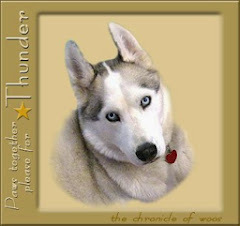 Natural Bach flower essence to help reduce stress and anxiety in pet. Check with your vet first before giving it to your dog. 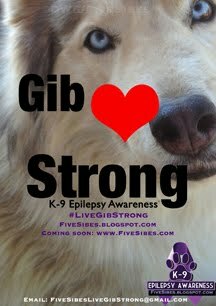 Epi-dogs who are on Phenobarbital many times are on Milk Thistle to help cleanse the liver. I used Oregon's Wild for Gibson. Always check with your vet first to see if you can add this supplement, and for dosage (goes by weight). 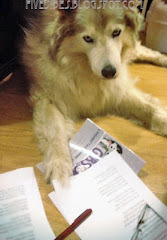 For Epi-dogs, weight gain from meds is a common side effect. To help counteract weight gain, I adopted the "pumpkin diet" for Gibson, which included replacing some of the kibble with pure pumpkin puree. Always check with your vet first and to go over proper amounts. This stuff is ah-mazing! Great for so many health benefits that can counteract some triggers, as well as helping strengthen a dog's overall immune system. 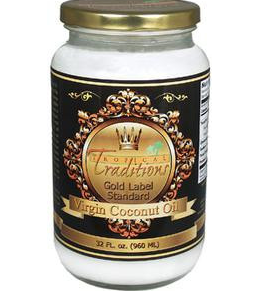 Read my blog post HERE on the benefits of coconut oil. Click HERE to order. 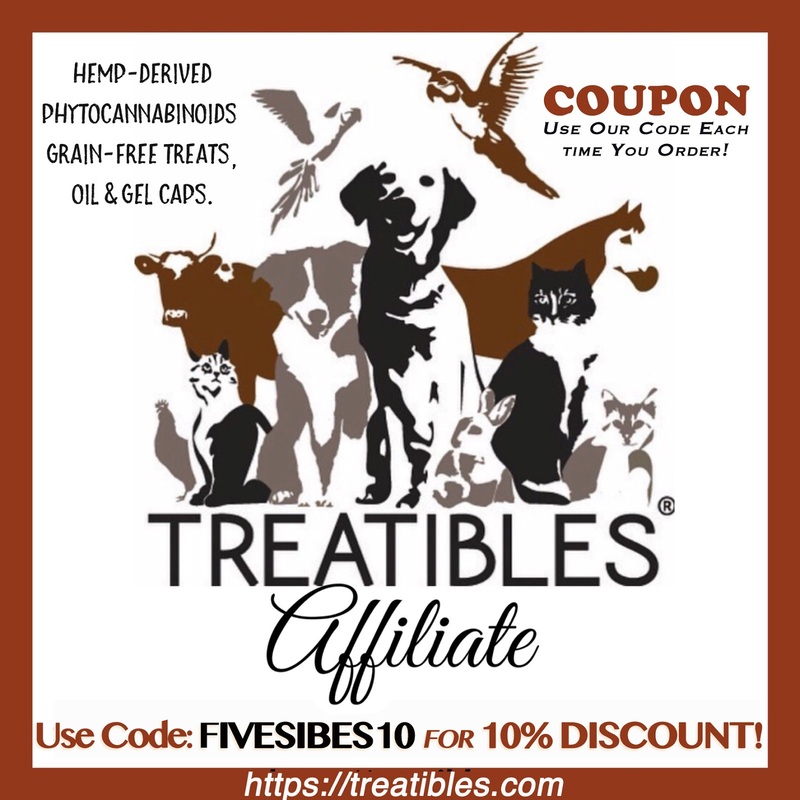 There are SO many wonderful things to say about these hemp-derived phytocannabinoid grain-free treats, oil & gel caps. Blog review to come! 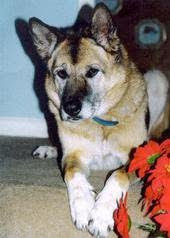 I give my FiveSibes, who are now senior dogs with arthritis issues and my Harley has had adult onset seizures, the treats and/or oil on a daily basis. 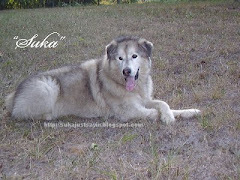 They really enjoy the pumpkin and blueberry treats, as well as the new soft chews, which are great for senior dogs who may have issues eating harder treats. They are also grain-free, which is great for Epi-dogs and non-Epis! I am very, very happy with this natural treat. 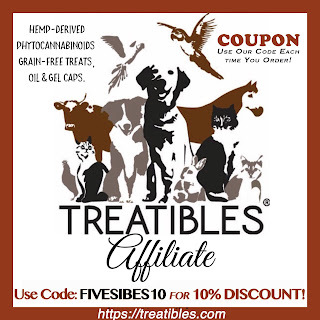 Learn more about Treatibles for pets at the website HERE. 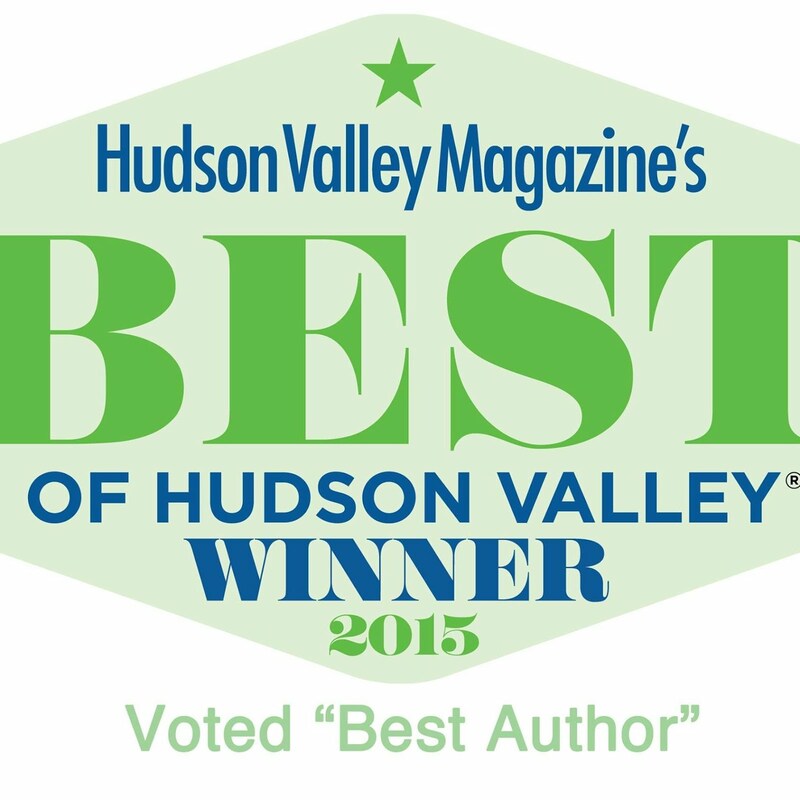 Independent Press Award recipient for Outstanding Resource Book. 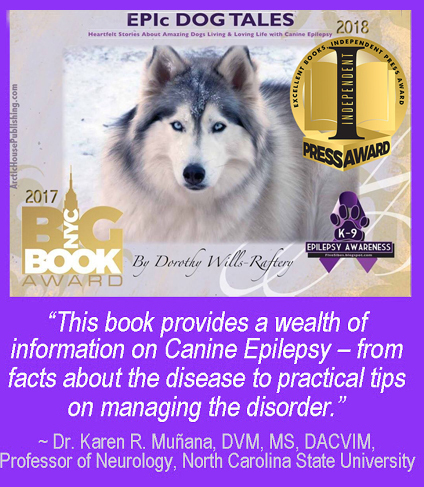 A beautiful, large, coffee table style book filled with stories about 124 amazing Epi-dogs from around the world, as well as a vast resource section. 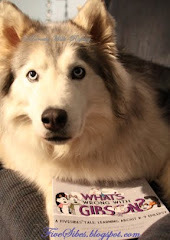 A must-have first one-of-a-kind resource book! 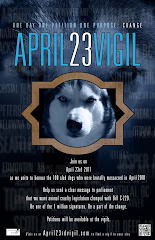 (A portion of sales is donated to Epil-K9 Foundation). 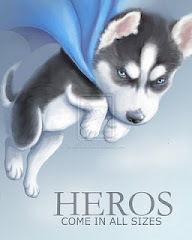 Selected by American Pet Magazine's as "Best in Print" and Talent Hounds "Top Dog Book for Children." What's Wrong With Gibson is a brightly illustrated children's book featuring my FiveSibes as they help Gibson after he suddenly has a seizure. 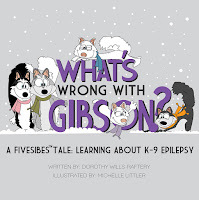 A great way to help kids understand Epilepsy (both canine and human) and to learn to not be afraid. Even a tip or two to help! 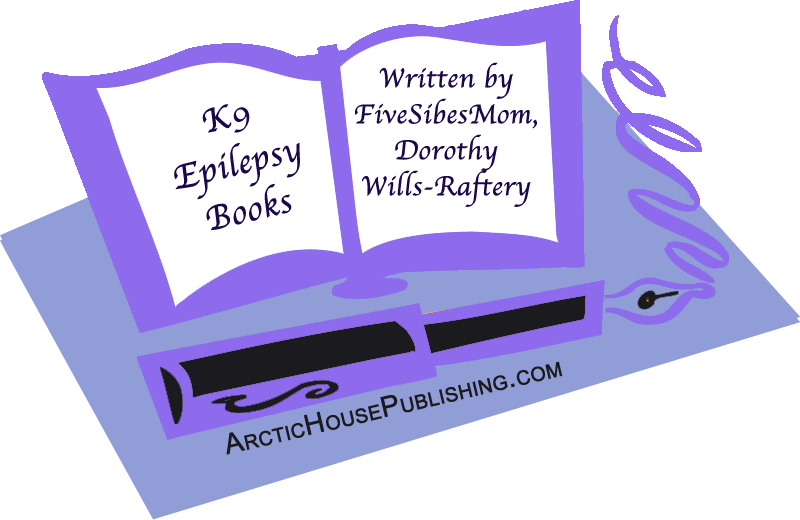 A portion of sales is donated to the Epil-K9 Foundation. So proud of this partnership! 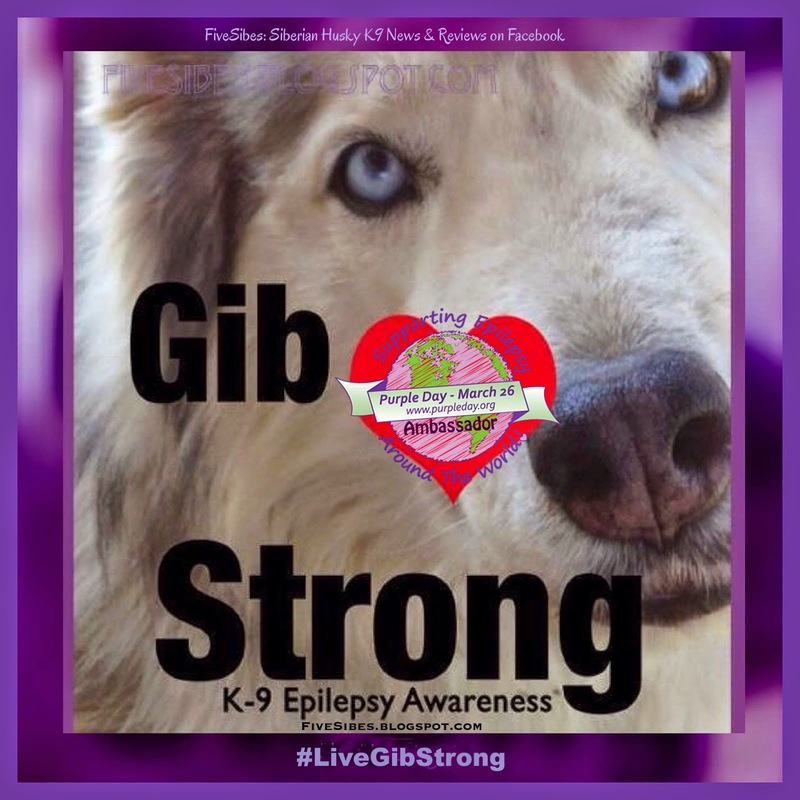 Debuted on Purple Day 2018, these FiveSibes #LiveGibStrong K-9 Epilepsy Awareness & The Anita Kaufmann Foundation/Purple Day Every Day #Paws4Purple Program educational materials are FREE for the asking! 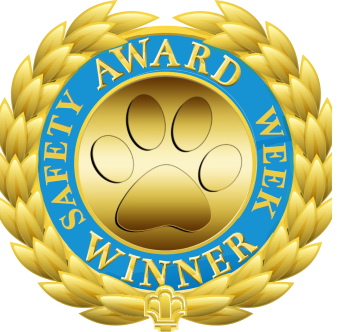 Great handouts for rescues, shelters, vet clinics, ER hospitals, groomers, K9 classes, even schools, police and fire departments! Email annmarie@akfus.org and put #Paws4Purple Materials in the Email subject line. 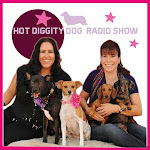 Super helpful FREE digital app journal--a must for all Epi-dog families! 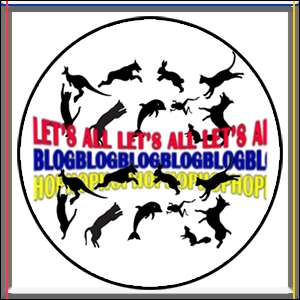 Read all about it and how to download in my blog article HERE! 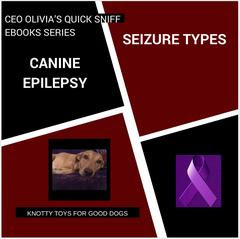 A informational FREE E-book series from Epi-dog Olivia of Oh, the Life of Olivia and Canine Executive Officer for Knotty Toys for Good Dogs. To download books, visit HERE. 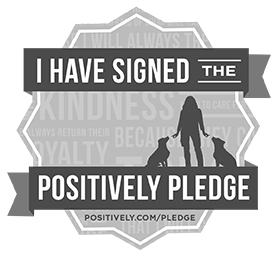 I do not receive any compensation or commission for the following items, but they are wonderful things I love to have in my household, for both Epi-dogs and non! (Read my blog article about it HERE). These wholesome gluten-free, salt-free, and preservative-free hand-crafted dog treats made in the USA specifically with the Epi-dog's diet in mind. 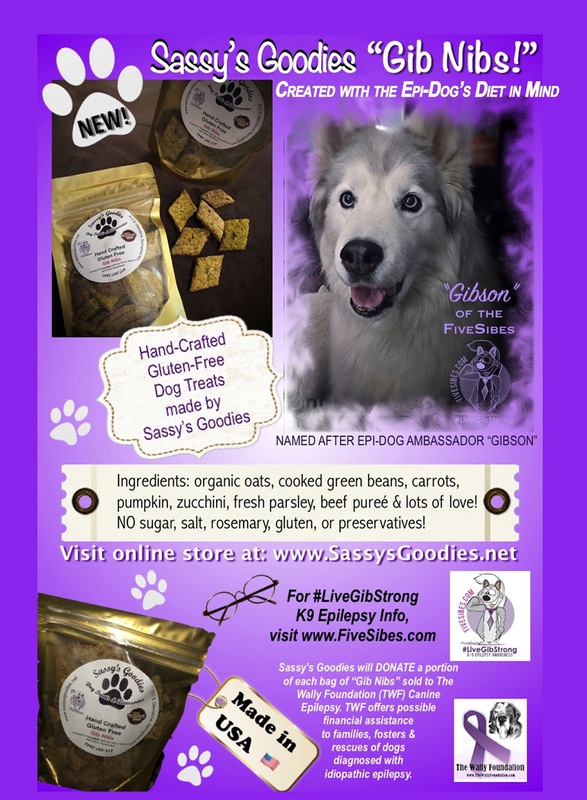 Sassy's Goodies also DONATES a portion of sales to The Wally Foundation-Canine Epilepsy (TWF). TWF offers possible financial assistance for anti-seizure medications to families, rescues, and fosters of dogs diagnosed with idiopathic Epilepsy. To order, visit HERE. 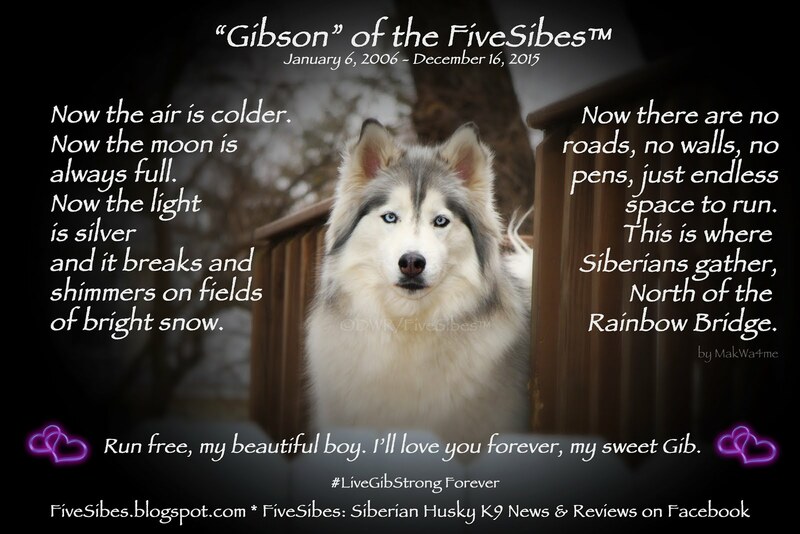 Gibson, my Siberian Husky Epi-dog celebrity! 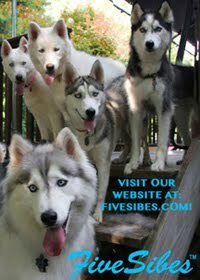 Ahhh-mazing little things that can help an Epi-dog, a senior dog, or any dog walk on potential slippery surfaces. You can read my blog article on them and learn how to order HERE. Check out video below! 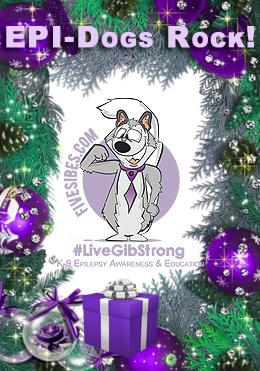 That's an awesome idea to cater holiday gifts to a particular dog's needs, like getting things that could help a dog with epilepsy. Both my boys are healthy but my Kit is almost 10 so I did end up buying him some "older dog" gifts like a warming bed that I'm hoping might help ease his arthritis a bit. I think we have that calming collar you mentioned, it smells lovely! 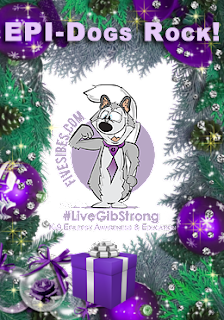 I actually already finished holiday shopping for my dogs, lol, I wanted to get as much of my shopping as possible done early this year! What a great list. 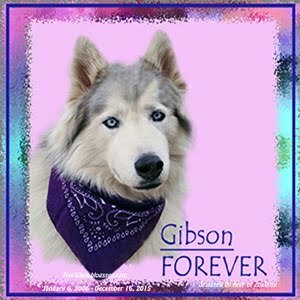 You and Gibson are very inspirational. Dexter as a neurological condition that sometimes presents with bobbles and wobbles. I use a lot of these products for his care too. 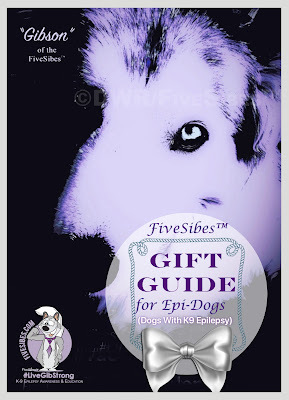 What a great idea to make an epi-dog gift guide. I am sure that some dogs are really going to love these suggestions. 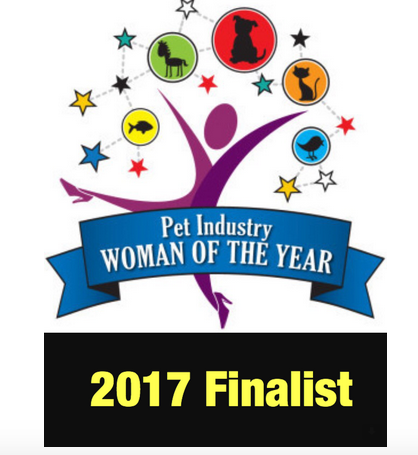 Holy wigglebutts - that is one epic list, Dorothy. We love the GingerLead and love that you shared so many ideas. 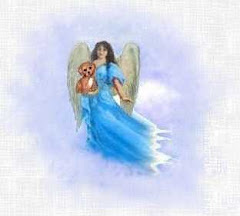 This is a comprehensive gift list! A lot of work went into this and it's fantastic. 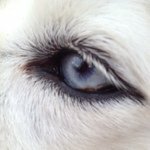 There are many great ideas here for all pets! wow what an amazing gift guide! I live in Florida so that water spray and the water bed are definitely items to consider for my Bells'a comfort. The K-Laser also sounds like a great therapy too. This is a really comprehensive list and a lot of valuable resources. Would be a great guide for anyone just starting out with an epi dog too I think. That water bed looks like a great item. I loved Gib’s picture with the spray fan. These are all great gift items. 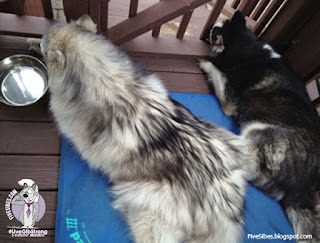 Most can also be so useful for any dog, especially Huskies, like the cooling products. Thanks for sharing! Tweeting & pinning. I met the people from Gingerlead. 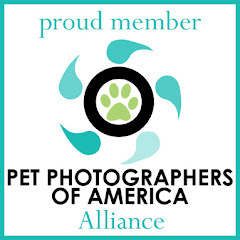 Their support is THE most amazing thing for dogs (and cats too). 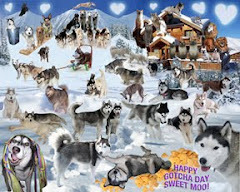 This is a fabulous range selection and I love the cool collar best of all! You guys like the Cool bed too? Awesome. Jasmine loved it and Cookie loves it as well. This is a super important issue that needs more awareness! It's not talked about nearly enough! Thanks for educating the general public. I love the addition of your first aid kit, I really need to get a thermometer for my dogs. 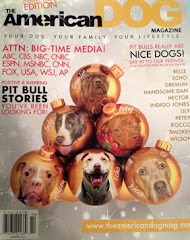 What a great list of gift ideas for the dog owner. 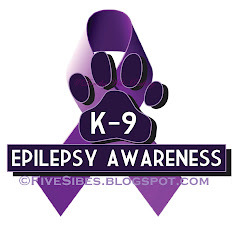 Many of these items would be great for any dog, not just those who have epilepsy. I think I could use some of these for my mom’s dog.